J. D. Schraffenberger: Maybe I’m over-identifying as an editor myself, but I think Fracture is an impressive literary achievement, one that I think most people won’t realize was a huge undertaking requiring a lot of different kinds of meticulous work. You and Stefanie (Brook Trout) have brought together so many remarkable pieces of writing while also creating a feeling of community, which I think is unusual for a publication like this—a beautiful rarity. What were the unique challenges of editing this anthology? Tell me about the whole process, from conception, to publication, to promotion. Taylor Brorby: Time was, perhaps, our biggest challenge. After living in the Bakken oil boom (of western North Dakota) and researching widely about the impacts and side effects of hydraulic fracking, I knew we needed to get this book out quick—and we did. We proposed the book in September 2014, opened for submissions that November, closed submissions June 2015, edited all summer, and delivered the final copy in August. The book was released in February 2016. Time was not the only issue—the sheer number of people we wanted in the anthology was staggering: we have over fifty contributors. When I originally approached Steve Semken at Ice Cube Press, I told him the book would be roughly 200 pages—250 maximum. The tome weighs in at over three pounds and nearly 500 pages. 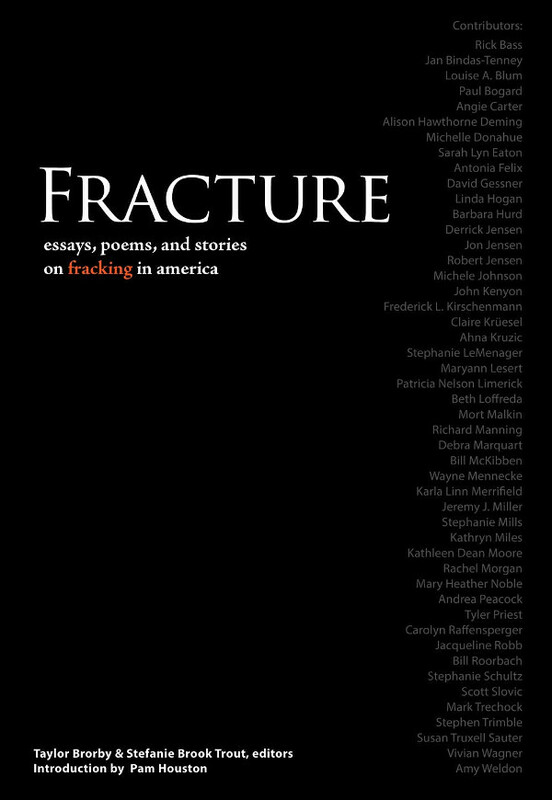 In developing this anthology, I felt we were building a case against hydraulic fracking and our supposed dependence upon fossil fuels. Yes, I thought, I could write my own book on fracking (I since have), but what I really wanted was a choir of voices, representing a variety of bioregions, to sing out against this practice, to build a stronger argument—through art—about what this type of technological marvel has brought to people’s lives. We have over twenty-six states represented in the book, and I’m proud of that. JDS: I want to ask a question about influence, but I’m also cognizant of your beautiful essay “Confluence,” which is forthcoming in the pages of the North American Review. I have myself tried to reconsider literary influence as a kind of confluence instead—as you say “of convergence, of joining.” So tell me about yourself as a writer, a thinker, and a person. Describe the confluence that is you. TB: I’ll address your initial question of influence, especially regarding Fracture, and then move to my conception of self. Fracture falls into a unique line of literary works that are set to take on timely topics. The three other books that inspired this project were Wallace Stegner’s This is Dinosaur, Stephen Trimble and Terry Tempest Williams’s Testimony: Writers of the West Speak on Behalf of Utah Wilderness and Rick Bass and David James Duncan’s The Heart of the Monster. These three projects let me have faith in assembling the myriad of voices that weave together in Fracture. Now, as for me. Jeezes, what a hard question. For me, it begins and ends with land. The beautiful bentonite bluffs of western North Dakota are my backbone and the sediment-laden Missouri River is the main artery that is me. You have to understand that I grew up fifteen miles from Fort Mandan, the place where Lewis and Clark spent more time than any other on their western journey; thirty miles north of Fort Lincoln, where General Custer lived before heading west and (thankfully) got killed at the Battle of Greasy Grass; and 100 miles from the Elkhorn Ranch, where Theodore Roosevelt lived to recover from the deaths of his mother and wife (both died on the same day in the same house). I grew up surrounded by stories. But I also grew up roaming beyond the wheat field behind our house. At nearly thirty, my childhood feels more akin to most people of my generation’s grandparents’ childhood. I went fishing and didn’t have to be home until supper. I could have broken a leg and no one would have found me until nightfall! But, too, my young adulthood was impoverished when it came to books. I grew up in a house without any and, if I had one that I was reading, my parents would tell me to “go do something,” which meant go outside and play. It’s that upbringing, though, that developed my fierce attachment to the world—to the sage grouse, the western meadowlark, the pallid sturgeon, all creatures I now fight to protect. And, I suppose, this is what’s lead me to claim Wallace Stegner as my favorite writer. He writes so beautifully, empathetically, and fervently about the part of the world I know best: the western United States. He embodied my love of teaching, writing, and activism and is a guide in how to live a decent, generous, and magnanimous life. JDS: In Coming Alive you write about how you never intended to become an activist, which is how many people now identify you. Instead, you express your desire to stay home, read, write, and make art—again, I can relate, as many introverted writers and artists will, too. Can you tell me not only what compelled you to “come alive” as you witnessed the oil boom in your home state of North Dakota, but also how the compulsion might also be thought of as a creative impulse? That is, how might activism itself become artful? TB: It’s a simple answer: I saw the prairie of my home dance as if it were the Lake of Fire from the book of Revelation. It’s as simple as that. When you grow up in a land that does not spew fire and, suddenly, you return as an adult and see that men—because all the workers in the Bakken oil boom are men—have rammed metal and concrete rods into the ground, you simply think, This has to stop. North Dakota is the least visited state in the country, which means not a lot of people give two cents about my home. But I do. I have four nephews that live there. Four nephews who I want to grow up and love the prairie that I love. But they can’t do that if radioactive material is in the Missouri River and the flares fume across the forever-expanding North Dakota horizon. It is that, and concepts of love, commitment, and responsibility that drive me to the page. I do not struggle with writer’s block—and I wish that were an egotistical statement—but these days it is a great luxury to write about anything beyond trying to protect the species we share the planet with, or working to undermine the status quo (including status quo stories as Howard Zinn would remind us). I simply choose to roll up my sleeves and write about very real problems in very real areas, using people like Charles Bowden, Alison Deming, Kathleen Dean Moore, Rick Bass, David James Duncan, Terry Tempest Williams, and Chris Hedges as models. Virtue is not rewarded in this culture, but damn, if you write a good story, that can shift the world—and I believe that is virtuous. The best writing is art—but I worry in our obsession over “creative writing,” whatever the hell that is, that we have forgotten the art of thinking and, instead, focus just on plot, dialogue, and character. I’m looking for meaning, which our lives sorely lack these days. The writing I love best is the type that follows an interesting mind on the page. In addition to those writers above, we have to remember Emerson, Montaigne, Woolf, Bill Holm, Paul Gruchow, James Baldwin, Thoreau, Annie Dillard, Jack Gilbert, Zora Neale Hurston. The list can go on. But these are thoughtful, engaging writers that push us to pull back the veil of what is and see what could be. That is the realm where real art flourishes. JDS: It’s sometimes hard as a writer to have faith in your own work as a necessary and efficacious way to respond to the injustices of the world. I’m thinking of your forthcoming collection of poems from Ice Cube Press, Crude: Poems About Place, Energy, and Politics. What gives you faith of this kind in art? What sustains you as an artist who wants to effect real political change in a stubborn world? TB: I suppose it’s my good fortune that I don’t view my writing as precious. I have a lot of work to do and a lot deserves the attention of writers. I’m not afforded the good fortune to write about imaginary world or the woes of my interior life, as interesting as that might be. I have the topic of the Great Plains and the American West—those are large, interesting, complex areas with large and interesting and complex histories; it’s my job to pick those places up like water-worn stones, hold them up to the light, turn them over in my hand, and then document what I see, including the good and the bad. I’ll make it simple: What sustains me is that somehow we big-brained creatures need art. And I know that we need stories. The incredible thing is that we can write made-up stories, we can write villanelles, we can write love sonnets, we can write lyrical essays. Something deep in our tissue craves all this. I mean, my god, go to a funeral and what do you hear: stories. Go to a wedding and what do you hear: stories. Come to a bar with me and what will you hear? Stories. That sustains me. To effect real political change, all it takes is one really good story, well-told. We’re still searching for that story, and my hope is that there will be multiple stories at the end of that search, not just one. JDS: In addition to being a writer, you’re also the Reviews Editor for Orion, which has been one of the most prominent locations for environmental writing of all kinds for over thirty years. How did you get involved with Orion, and how do you decide which books to review? I literally got an e-mail out of the blue asking me to serve as Reviews Editor at Orion. I screamed out loud. I think the neighbors heard me. The books, oh dear god the books. I probably get 20-30 a week, which is great, and it’s also overwhelming. I have a certain taste in literature, and I also, on occasion, attempt to temper my taste. I keep asking myself over and over, What book does the world need right now? And I try to answer that with the “Reviews” section. When Chip brought me on at Orion, he told me that, historically, Orion was largely white, straight, and New England. I’m only one of those things. So I try to bring in a variety of writers—queer, people of color, people from different bioregions, and concepts Orion might not, historically, have focused on. For instance, I was really proud we reviewed Hell Is a Very Small Place, an anthology of essays written by people currently in solitary confinement. I mean, what speaks more to the importance of nature and societal interaction than reading firsthand accounts about being deprived those very things? So, I try to dig and search for books that our readers not only will enjoy, but also ones that might push their thinking about issues related to environment and culture. JDS: For someone so young, you have already accomplished quite a lot professionally. What is next for you? What can we look forward to seeing from you in the future? TB: Getting a job. Colleges and universities, I’m still on the market! But in all seriousness, I’m working on another anthology (a smaller one) that takes the classical Greek elements of earth, air, fire, water, and ether and pairs it with what I’m calling 21st Century elements, such as community, abundance, humor, diversity, and so on. All of these will be looked at through an environmental lens in an attempt to help re-root us to the work ahead. Beyond editing, I’m under contract to write a memoir for Milkweed Editions that documents my upbringing supported by lignite coal and my subsequent development as an environmental thinker. Usually, in the environmental world, we read texts written by people who, ideologically, are fighting on behalf of the planet, but we don’t have a story by someone whose inheritance was fossil fuel money and chose to bite the hand that fed him. That’s my story. So I’m spending my time in my office, banging my head against the wall, trying to figure out how I got this way in an attempt to provide a model for others to better understand how we all need to begin biting the hands that feed us in order to ensure we have a planet we can survive on. JDS: Thank you so much, Taylor, for the work you do, and thank you for taking the time to answer these questions. Taylor Brorby received his M.A. in Liberal Studies from Hamline University in 2013, and is currently pursuing his M.F.A. in Creative Writing and Environment at Iowa State University. Taylor’s work has appeared in Orion Magazine, Rock, Paper, Scissors, The Englewood Review of Books, the Northern Plains Ethics Journal, and many others. Also, his work is forthcoming in the anthology Kissing in the Chapel, Praying in the Frat House: Wrestling with Faith and College.